3500 Miles. Dual Sport Heaven. Dozens of Loops & Options. Free Download. 3500 miles of Michigan’s fantastic Dual Sport riding. Big loops, little loops and linear options. Ride as much as you want, how you want. There are two main loops, one in the LP for 1100 miles and the other in the UP for another 1000 miles. There are 1500 additional miles of options. You can combine them in any way that serves your needs – from an 100 mile, single day loop on up to a couple thousand mile, week-long adventure. The area covered includes most of the UP as well as a good half of the LP. Want to spend a week riding one big loop in the lower peninsula? No problem. Want to spend a day riding which loops back to your truck? No problem. Want to camp from one location and ride different stuff for 3 days, coming back to camp on each day? No problem. These routes are straight from GLDS’s playbook. Think of it as just a taste of what our rides are like, and yes, our events have even more “good stuff” than you’ll encounter while on this expedition. 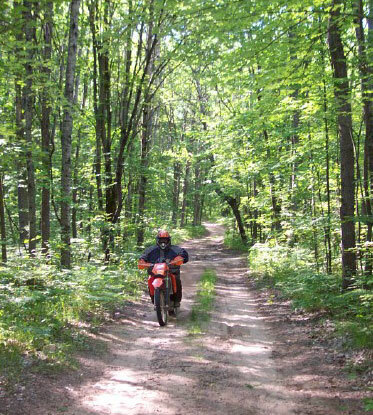 Here’s your chance to experience Michigan Dual Sport riding the way we love, but at your pace and your schedule. It’s mostly two track with some road connectors and the regular pavement sections to get to gas stations plus an occasional stretch of single track. You will need a street legal bike with knobby tires. Plus a GPS. And an ORV Sticker. 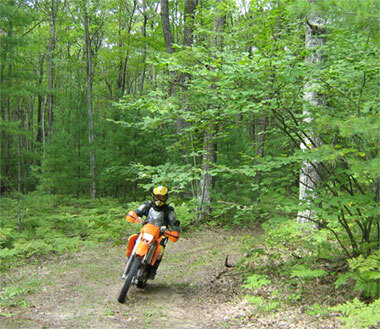 The terrain and course was targeted at a DRZ400. Anything bigger than a 650L will test the rider’s ability. Camp it. Motel it. Campground it. Day Trip it. All up to you. We figure two weeks straight riding to cover it all and doubt any mortal can do so. GPS data and the maps are offered up here for download. Free. No membership needed (but, hey, if you want to join it’s only $10). Download and load up your GPS, fire up your printer and crank out the map pages that you need. For those that need a CD with the files on it plus printed maps, we have a partnership with VVMapping to provide a physical product for the low price of just $30 (see download page for link). You may not sell or otherwise use these files for commercial purposes. This includes using them as part of an event. You accept all risk and liability associated with the use of these files and the navigation of any suggested routes therein. Only paths legal and open to the public were used originally – but things change and we do not monitor these routes. Roads close, bridges wash out, property changes hands, new rules are implemented and who knows what else (we sure don’t know). Don’t trespass. Don’t ride over your head. Be alert and stay safe. These suggested routes are open to the public and that means oncoming cars, washed out hills, hidden hazards and all kinds of other potentially nasty stuff. By following these routes you agree that it’s up to you and you alone to stay safe and legal and that we (GLDS, etc.) are not in any way liable for any misfortune that you cause or receive.